Irasec - Palgrave, New York, January 2017, 293 p.
As Southeast Asia experiences unprecedented economic modernization, religious and moral practices are being challenged as never before. 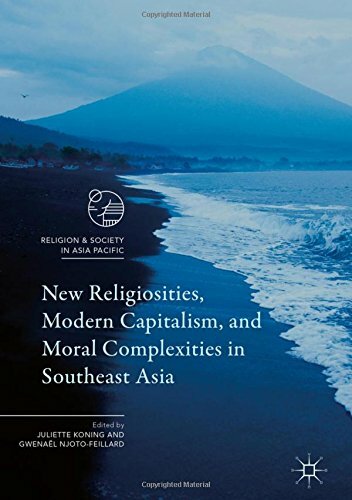 From Thai casinos to Singaporean megachurches, from the practitioners of Islamic Finance in Jakarta to Pentecostal Christians in rural Cambodia, this volume discusses the moral complexities that arise when religious and economic developments converge. In the past few decades, Southeast Asia has seen growing religious pluralism and antagonisms as well as the penetration of a market economy and economic liberalism. Providing a multidisciplinary, cross-regional snapshot of a region in the midst of profound change, this text is a key read for scholars of religion, economists, non-governmental organization workers, and think-tankers across the region. Juliette Koning holds a PhD from the University of Amsterdam, Netherlands, and is Reader in Organization Studies and Asian Business at the Business School of Oxford Brookes University, UK. As a social anthropologist, Juliette studies organizational processes, in particular the study of small business organizations in Southeast Asia. Gwenaël Njoto-Feillard holds a PhD in political science from the Institut d’études politiques de Paris (Sciences Po) and the Centre for International Research and Studies (CERI), France. A specialist on Islam in Indonesia, he is currently a Visiting Fellow at the Institute of South-East Asian Studies (ISEAS) in Singapore, as well as being an Associate Fellow at the Center for Southeast Asia in Paris (CNRS-EHESS) and at the Institute of East Asian Studies (IAO, CNRS) in Lyon, France.